Substantial and beautiful original Victorian pine six panelled door, the top two panels fitted with decorative stained, coloured and textured glass, and the rest fitted with chunky decorative bolection mouldings to one face, and flush-fit to the other. The door is fully mortised and tenoned, and suitable for external use. 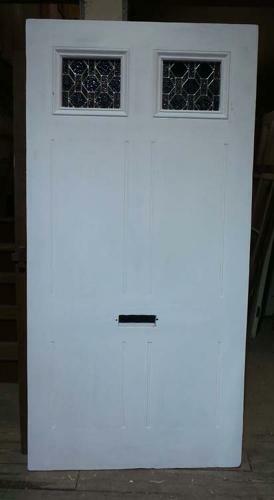 The door is in excellent condition, and is currently undercoated, ready for painting. The door is fitted with fully restored stained glass that will meet current safety standards.